Dubai, UAE, October 23, 2017: A glittering awards ceremony has capped off a successful three days at the Middle East's premier lighting design and technology exhibition, where a dedicated student showcase and the launch of the region's first institute dedicated to lighting education and knowledge were among the many highlights. The 12th edition of Light Middle East concluded on 19th October 2017 at the Dubai International Convention and Exhibition Centre, drawing in 5,755 visitors from 84 countries. Showcasing their latest products and solutions were 345 exhibitors from 30 countries, with the world's leading manufacturers and regional distributors mixing it up with their latest innovations, from smart home lighting and controls to LED street lights that integrate Wi-Fi, electric car charging stations, CCTV, loudspeakers, and motion detection sensors. That was before a fitting finale at the 5th Light Middle East Awards, where 700 industry professionals gathered at a gala dinner to celebrate the best in architectural lighting and design, as a shortlist of 40 projects and 29 products contested for the ultimate accolade across nine project and six product categories. The shortlist was drawn from more than 250 entries, with the most hotly contested category being the International Lighting Project of the year, where entries from France, USA, UK, Germany, and Italy made the cut. Abu Dhabi's Khalifa University, The National Museum of Oman, and Lightscapes at the Venice Architecture Biennale 2016 were among 15 winners on the night. Khalifa University was the only shortlisted project to be nominated for more than one category this year, with the UAE's top ranked university eventually winning the Exterior Lighting Project of the year. Dubai-based Umaya Lighting Design was tasked with the interior and exterior lighting of the recent Khalifa University extension, which comprised 169,630sqm and four buildings. Meanwhile, the National Museum of Oman by Sutton Vane Associates won the Public Lighting Project of the year, while Lightscapes by Transsolar Klima Engineering took the gong for the International Lighting Project of the year. An award also went to Team One from Heriot-Watt University in Dubai for their lighting project at Light.ication, a popular student competition at Light Middle East in collaboration with design studio Light Func. The initiative is aimed at nurturing the talent of future designers, where university teams, with the guidance of design studio professionals and equipment from Light Middle East exhibitors, conceptualise and display their own inspirational lighting installations during the show. In its 2nd year, Light.ication 2017 centred on the theme of the Holi Festival of Colours, with four teams from Heriot-Watt University, Manipal University, and American University of Dubai presenting artistic and thoughtful light interpretations through a variety of mediums. Supported by lighting design group CD+M, Heriot-Watt's Team One secured a close contest, with team member Apurva Jaishankar, who's in her third year of an architectural engineering degree, commenting: “We really enjoyed the journey that led us to this stage – even the onsite preparation and earlier sessions we had with CD+M was really useful for our careers. Light Middle East 2017 also featured the Think Light forum, a two-day conference discussing lighting from the three perspectives of concept, project and application, and featuring an expert speaker line-up of more than 30 interior designers, architects, lighting designers, and engineers. 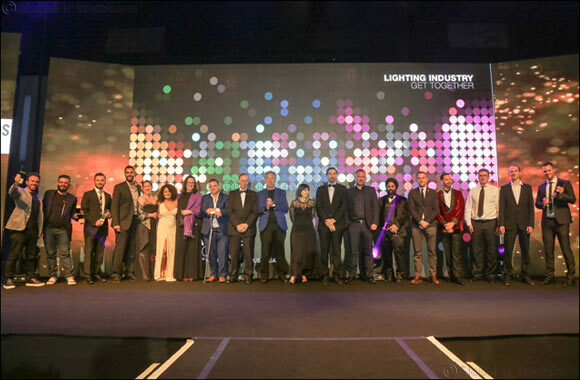 Think Light was the launch platform for the Lighting Institute, the Middle East and Africa's first virtual lighting design community that raises awareness of the profession and provides dedicated industry training courses throughout the year. Waleed Fakousa, Managing Director and Founder of the Lighting Institute, said the new entity will elevate the quality of lighting, architecture, and spaces across the region. Commenting on the new workshops and courses, Fakousa said: “There're many constraints that lighting designers have across the region, and one of them is that time is very limited, so having courses that provide the exact information needed that are affordable, reachable, and taught by experienced intellectuals is critical. “When the first idea clicked about two years ago to establish the Lighting Institute, we thought Light Middle East was the best place to launch, as it's the largest lighting platform in the region and has a lot of eyes on it from different parts of the world. “In the future, we plan to work with universities to establish more lighting Master's and PhD programmes, while also working with governments to improve light pollution levels across the region and influence decisions on lighting and the future of illumination,” added Fakousa. Meanwhile on the exhibition floor, returning major local companies such as Debbas, Cinmar Lighting Systems and Huda Lighting were presenting their latest services and innovations from global partner brands, while the likes of HCC Lighting and BMTC were exhibiting at Light Middle East 2017 for the first time in many years. Youssef Saidi, Chief Operating Officer at BMTC, said the company decided to return to the three-day event in 2017 after a ten year hiatus due to an updated product portfolio that falls in line with Dubai's vision to be the smartest city in the world. Saidi pointed to new product launches such as LED sports stadium lights from Eaton and LED tunnel luminaires by Belgian manufacturer Schreder with remote-controlled luminosity sensors, as examples of its smart lighting solutions. BMTC was also showcasing the Schreder Shuffle, a street lamp comprising a modular structure that allows for features such as loudspeakers, CCTV, Wi-Fi internet access, electric vehicle charging stations and visual guidance. “As a systems integrator and innovator, we wanted to show the public, our partners, and clients that we're bringing new technologies and disruptive solutions that are in line with the smart city vision that Dubai has set,” said Saidi. “The Schreder Shuffle street lamp for example connects people to their local environment. It can even be adapted to fit speed radars and we've our own technology being integrated within the lamps that allows us to address every single pole individually or all the poles collectively. Light Middle East has established itself as the region's number one networking and sourcing platform for the entire scope of decorative, architectural, outdoor, and indoor lighting solutions, attracting a wide range of visitor profiles from around the globe. The international flavour was underlined by country pavilions from Italy, France, and the UK, while 52 UAE exhibitors took up 2,130sqm of exhibition space, an impressive 27 per cent year-on-year growth over the previous year. Another returning feature was Ready Steady Light, the hugely popular lighting design competition in partnership with the Society of Light and Lighting in the UK, where several teams designed and installed spectacular lighting schemes in just 90 minutes on the first evening of the show. The winner, who was crowned at the Light Middle East Awards, was Team of the Dragon, comprising a number of local designers. Ahmed Pauwels, CEO of Light Middle East's organiser Messe Frankfurt Middle East, said: “Light Middle East 2017 has fulfilled its objective of creating a vibrant atmosphere where experts in diverse disciplines come together to present, discuss, debate, exchange and explore best practices and emerging concepts. “A large number of major industry players were board again this year, while the many new companies that took part reinforces a bright future for the regional lighting sector. “The latest in innovative technology as well as key insights into the road ahead for lighting technology and design was on offer, while the exhibition continues to be the premier launch platform for global players looking to engage with this promising region,” Pauwels added.